Okay, I have finally returned from my back-to-back vacations! Vacation #1: vacation with my family in the Outerbanks, NC – home for 5 days (literally) – Vacation #2: vacation with my husband’s family. Whew! It has been one heck of a summer. I know, I know, you have no pity for the woman who has been on vacation for almost the entire month of July. Even though I had a great time on my vacations, I was somewhat looking forward to getting back into a routine of some kind. There is some comfort in routine, right? 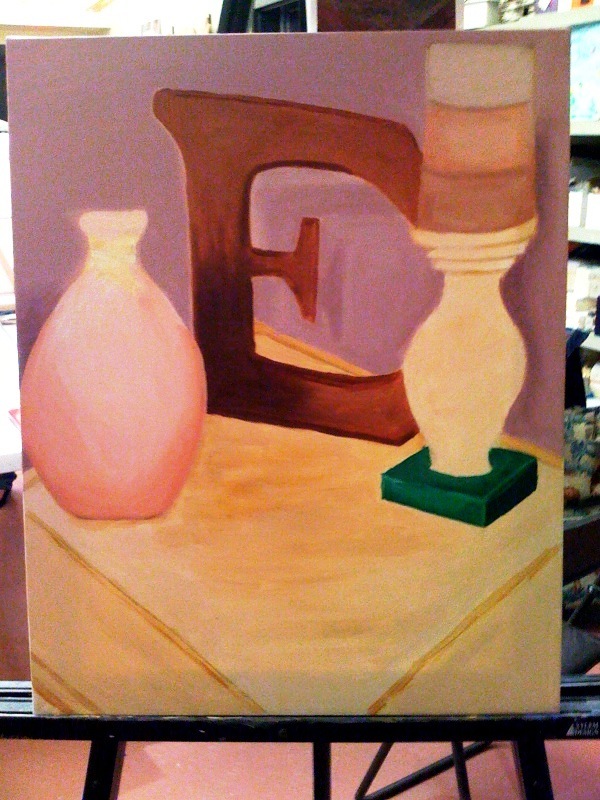 I had painting class on Monday night (my 2nd to last one) and even that is starting to get on my nerves! How could this be? It’s supposed to be stress-free me time. If you recall, I got into painting because it has mostly no rules, isn’t rigid and can be whatever (the opposite of my life). Well, not according to my art teacher. I’m doing a still life right now and just about done with it. At least, I that’s what I thought. Please look at my candlestick – for some reason, she wanted me to correct the right side of my candle. She thought I needed to fix, well, I don’t even know! Do you see something extremely wrong with my candle on the bottom right side where it meets the candlestick? I mean, really! You can tell it’s a candle and a candlestick, right? That is success for me – especially for my 2nd painting EVER! Why does it have to be exact? I thought that was why I was taking painting – to NOT be exact!! I’m tired of being exact!! I told my husband that after my last class next week, that I may take a break from painting class and try some on my own. I do have some ideas of what I would like to paint, so I guess I will give it a shot all on my own. I think I’ve got the basic gist of oil painting – it’s really the drawing part that I really need help with :)! Our house is now falling apart one piece or part one after the other (probably due to age). Monday (same day as painting above!) we had to have the water softener peeps come out and fix our 7-year-old water softener – $200. Tuesday, we had to have the electricians out to rebuild our breaker box from SCRATCH! We had no power (no air conditioning, no computer, no nothin’) from 8:30am to 4:00pm – $1700. Welcome home, huh? The bad thing is that I think our dishwasher is getting jealous and wants a “fix up” job, too. This entry was posted in Everyday Life and tagged appliances, electricians, reality, reality bites, reality check. Bookmark the permalink. ← Relax . . . You’re on Vacation!